Universal Orlando just announced a new open-fire cooking experience that will be known as Bigfire. Warning, the food looks delicious! Universal Orlando – This summer, we’ve got you covered for a relaxing night out with delicious open-fire cooking. 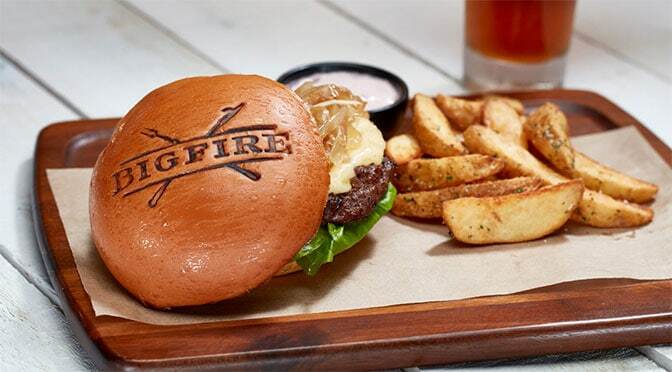 Bigfire – the newest, highly-themed restaurant to come to Universal CityWalk – will leave you feeling as though you’ve stepped into a grand lakeside lodge. This new venue will be located between VIVO Italian Kitchen and Jimmy Buffett’s Margaritaville on the edge of the lagoon – offering incredible views of Universal CityWalk. I’ll give this one a try when it opens. What do you think? YUM! This is one place I’d like to try. Any opening date on this?